I'm not getting much accomplished on my list of projects these days, but I'm sure having a lot of fun! Here's Miss Tiggywinkle at one month, bright-eyed and nearly the same size as her cuddle bunny. I'm sure she's smiled at me already, although some people say it's just gas. The Little Miss has spent the last two days here with Nana. We've watered the garden, played in the park, splashed in the pool, and yesterday, we painted. Little Miss knew just how to dip her brush in the paint pot and swipe it over the paper. But then her little hand got dirty and she put it into her mouth to clean it off. That was the end of the painting because Nana had given her pudding as paint! Pool time followed painting for a good reason. Now that summer is here (oh glorious thought!) we took an evening stroll along the beach. Long slanting rays of gold illuminated water, gently bobbing sailboats and houses tucked into the trees with soft summer light. Ahhh. Ahhhhh...indeed. It's time for summer to arrive. The baby is so adorable...love the hair and the bright expression. The last few sentences tell me that you have found your happy place. Love Miss Tiggywinkle's hair . . . so adorable. Chocolate pudding paint is such an awesome idea. So happy that summer found you. I think you have the best thing going there this summer with the sweet new baby and big sister. Good idea for the paint, but who could resist licking the brush? Have a nice weekend and hope your weather has turned for the better. Summer, yes! 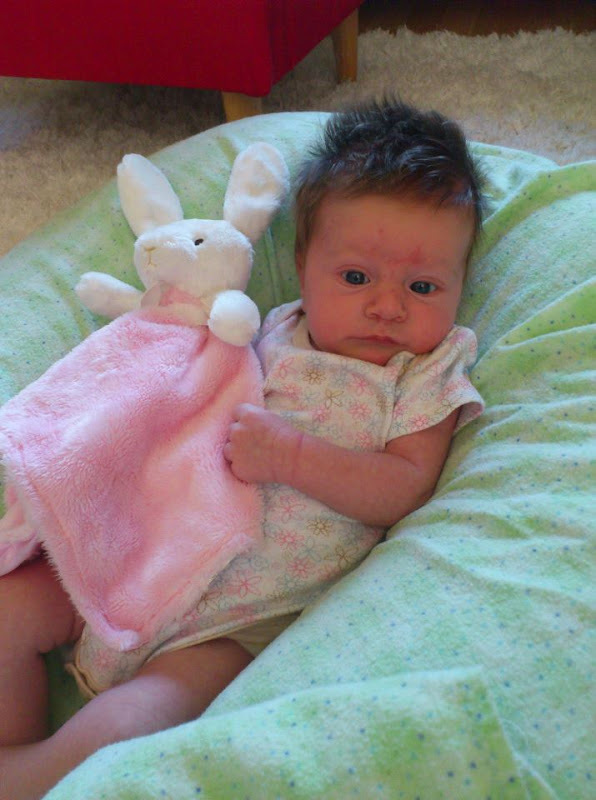 I love the baby's hair and beautiful eyes! She had her eye on the camera and that is definitely a little smile. And such a lovely young artist! You must be in heaven. I can imagine that many things are left joyfully on the wayside when the little ones are around! What a treat it must be to have time with them. Isn't our first foray into summer beautiful? I played hooky today and loved every minute. The dear misses are so precious. Your dear little granddughters are so sweet - you must be smiling from morning til night! Glad to hear that the sun is shining down your way! I'm sure it was a smile! Looks like summer is getting off to a great start! Perfect Nana time -- lovely!